For the capital of ancient Macedon, see Pella. For other uses, see Pella (disambiguation). 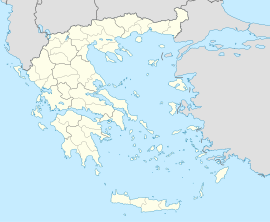 Pella (Greek: Πέλλα) is a village and a municipality in the Pella regional unit of Macedonia, Greece. It is located on the site of ancient Pella, the capital of the Kingdom of Macedonia and birthplace of Alexander The Great. The capital of the municipality is Giannitsa, the largest town of the regional unit. On the site of the ancient city of Pella is the Archaeological Museum of Pella. During the Byzantine and Ottoman periods, the town was known in Greek as Άγιοι Απόστολοι (Agii Apostoli) 'Holy Apostles' and in Ottoman Turkish as Allah Kilise 'God's Church'. In the local Slavic language, the name is Postol (Постол). The name Pella was revived in 1926. Ancient Pella was a vast city. However, the city was ravaged by the Romans during the 1st Century BC and lost its significance. By the 19th century, Agii Apostoli occupied a site near the upper city, and the lower city extended down to the wetlands of Mavroneri. Félix de Beaujour, a French consul of Thessaloniki at the end of the 18th century, wrote in his travels for the Ottoman Empire: "Pella rises amphitheatrically on the slope of a hill on the top of which was the fortress, at the present is a little village of Alla Klise, populated with Bulgarian Christians." The village joined the Bulgarian exarchate and a survey by Vasil Kanchov in 1900 revealed that the population of Pella was 520 Bulgarian exarchists. Another survey in 1905 recorded that in the village there were 720 Bulgarian exarchists. The municipality has an area of 669.220 km2, the municipal unit 113.819 km2. The municipality has a population of 63,122 (2011 census). The capital of the municipality of Pella is Giannitsa (population 29,789 at the 2011 census). Other towns are Krya Vrysi (pop. 6,535), Mylotopos (pop. 2,605), Pella (pop. 2,450), Galatades (pop. 2,339), Karyotissa (pop. 1,999), Aravissos (pop. 1,800), Ampeleíai (pop. 1,095), Melíssion (983), Pentaplátanon (956), and Paralímni (816). Alexander the Great (356–323BC) King of Macedon who created the biggest Greek empire that ever existed. Philip II of Macedon Father of Alexander the great and king of Macedon from 359 BC until his assassination in 336 BC. Krste Misirkov (1874–1926), philologist and publicist. ^ Beaujour, Félix de. Voyage militaire dans l'empire Othman, Paris 1820, p. 197. ^ D.M.Brancoff. "La Macédoine et sa Population Chrétienne". Paris, 1905, р.102-103.